What happens when a funny guy gets serious? 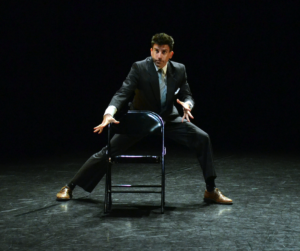 For dancer/actor/writer David Neumann, the recent deaths of both his parents have cast a shadow over his life and his current interdisciplinary work-in-process, I Understand Everything Better. Also on the program are more upbeat solos from the past, like Tough the Tough (Redux) and You Are In Control. The truth is, there was always something serious and searching in Neumann’s solos. Under the bumbling, staggering Everyman there was a thread of existential questioning, expressed in both movement and words. A few years ago, Neumann was brilliant in the Beckett program he shared with Baryshnikov, revealing an affinity for that absurdist/serious playwright. Before that, he brought a sharply quizzical quality to the roles he played in works by Big Dance Theater and Jane Comfort and Company. This evening is co-presented by Jacob’s Pillow, which has presented Neumann before with great success. April 26 at MASS MoCA’s Hunter Center for the Performing Arts. For tickets, call 413.662.2111 or click here. The final work I Understand Everything Better comes to American Dance Institute in Rockville, MD in March, 2015 and Abrons Arts Center in NYC April, 2015. Where in the U.S. can you see the works of Sidi Larbi Cherkaoui, Beijing Dance LDTX, and stars of Paris Opéra Ballet all in one festival? The answer is easy: Dance Salad in Houston. Artistic director Nancy Henderick searches the globe for tasty choreography to offer her audience in Houston. Her formula is to provide excerpts from a range of international works, some familiar, but mostly new. Almost every year includes something by the mercurial Cherkaoui, and this year it’s his Milonga with a cast of 10 tango dancers from Argentina, two contemporary dancers, and five tango musicians. Beijing Dance LDTX, a stunning group, performs two works by the husband-and-wife team Li Hanzhong, who co-founded the company, and Ma Bo. Treading on Grass is set to the piano version of Stravinsky’s Firebird, and Sorrowful Song is danced to Gorecki’s Symphony of Sorrowful Songs. Another highlight is bound to be Manuel Legris and Laetitia Pujol of Paris Opéra Ballet dancing the rapturous pas de deux from Preljocaj’s Le Parc and a duet from Neumeier’s Sylvia. Manuel Legris, now the artistic director of the Vienna State Ballet, was a POB étoile for two decades, and Pujol is a current étoile. But Dance Salad offers many other ingredients too. Dancers from the Royal Danish Ballet, Norwegian National Ballet, and Staaatstheater Wiesbaden from Germany, are also part of the festival. At no other one-weekend festival can you see so many top dance artists from Europe and Asia. It’s worth the trip. April 17–19, 2014, at Cullen Theater, Wortham Center, Houston. Click here for more info. It started as local activism around Florida water issues, and in a mere three years has grown to be nationwide, with 80 institutions in 30 states participating. From Alaska to Arkansas, from Maine to Florida, the National Water Dance aims to raise awareness about the politics of access to safe water. Students as well as professional dancers will gather around a body of water, be it a lake, river, ocean, or creek on April 12 at 4:00 EST. United by a single cause, divided by geography, they will participate in “movement choirs,” a form originated by Rudolf Laban, to urge us all to be more responsible about the water we use. Part of a larger global effort, the U. S. portion is masterminded by choreographer/teacher Dale Andree and producer Daniel Lewis, longtime director of New World School of the Arts. To see the list of schools and companies participating, click here. To get involved, contact Dale Andree at dandree@nationalwaterdance.org. Up next: Anti-Fracking Dances (we wish). We know it ain’t easy for a woman to keep a dance company going. So kudos on the 40th anniversary of the Margaret Jenkins Dance Company. With her experimental spirit, nurturing presence, and dance-body wisdom, Jenkins has helped make San Francisco a hub of dance. As a master teacher, she started the CHIME program to pair up mentors with emerging dance artists, a much needed service. As a choreographer she has expanded globally to work with dancers in China and India and, most recently, Jerusalem. Inspired by Israeli and Palestinian poets—and her own Jewish roots—she’s made a new work for the occasion, The Gate of Winds, in collaboration with the Kolben Dance Company of Israel. Also on the program is Times Bones, a look back on her past work performed to live music by the popular Paul Dresher Ensemble. 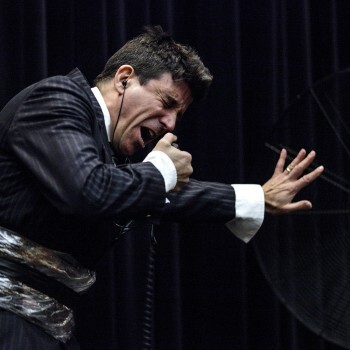 The anniversary is April 3–6 at Yerba Buena Center Forum and Theater, and will also tour to Connecticut, Louisiana, and Jerusalem. For more info click here. Choreographers may gravitate toward the coasts, but Chicago can claim some excellent dance makers too—and Autumn Eckman is one of them. She’s had a ton of commissions in the Midwest and has branched out to Maine, California, and Florida. But her home company is Giordano, for which she serves as assistant artistic director and resident choreographer. Her piece JOLT, which she worked on with artistic director Nan Giordano, races through a crazed morning routine to jolt you awake with wit, humor, and imaginative use of props. It’s performed with the blazing energy of the Giordano dancers. But she’s also capable of more lyrical, sweeping choreography, and her new Mist, with live music by Eric Whitacre’s choral chamber group Bella Voce, is bound to be slightly more romantic. March 28–29 at the Harris Theater. Click here for info and here for tickets. If you’re interested in how other forms of dance infiltrate ballet—and you live near Seattle—check out Peter Boal’s Director’s Choice evening at Pacific Northwest Ballet. He’s got company favorites by (post)moderns Susan Marshall (Kiss) and Molissa Fenley (State of Darkness), and TAKE FIVE…More or Less by musical theater mastermind Susan Stroman. What’s new? A world premiere by Alejandro Cerrudo, everyone’s favorite tall, skinny Spaniard, who can flip between classical ballet (silky pirouettes) and modern (large scooping moves), as he did for Wendy Whelan’s Restless Creature. March 14–23. Click here for tix. James Moore & Mara Vinson in Marshall’s Kiss. 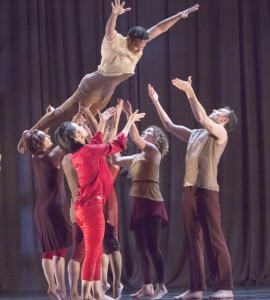 Homepage photo is of Stroman’s TAKE FIVE, with Kaori Nakamura; both photos © Angela Sterling.